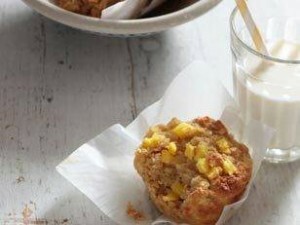 Whether it be for breakfast, morning tea, or an afternoon snack, these delicious pineapple and oat muffins are the ultimate sweet and healthy treat. In separate bowl, mix the wet ingredients before adding to the dry mix. Combine well. Add a splash of milk if too dry (this will depend on the consistency of the yoghurt). Bake in preheated oven at 180c for 30 minutes. Leave to cool for 5 minutes in the tin before turning out. Place onto wire rack to cool.